I'm evaluating Office 365 and have decided to track a small project in SharePoint online. I have created a project task list (Gantt chart) in Sharepoint. 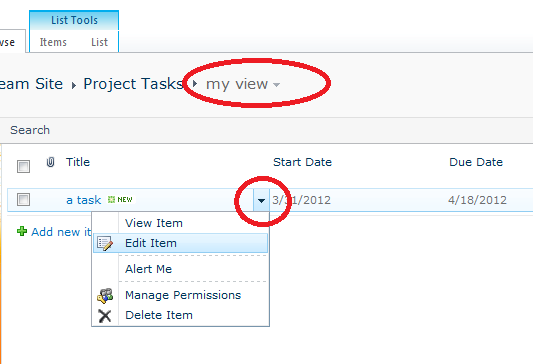 I have created an additional column in the project task list that I have named "Notes". I have configured the column to allow 6 lines of editing and allow rich text. The problem I'm encountering is when I tab over to the "Notes" column, it is greyed out and I cannot add anything to it. What am I missing here? The Project Tasks List has been coded to support the way it looks. It seems the grid view doesn't support entering text like a note field. You can still add notes, for instance to new items by creating them via the ribbon rather than typing new items directly into the grid. When editing existing items, I know the grid view you have now doesn't let you get into the item easily to add a note like the new item does. To get around this go to the ribbon and create a new standard view showing your items. This standard view allows you to open the items for editing easily and you can add notes. To can switch back to the grid view after notes have been added. 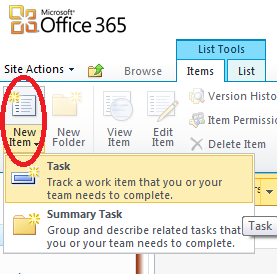 I know this is more of a workaround than a solution, but the views that come with the project Tasks List aren't standard SharePoint views, they've been enhanced to do what they do - but that makes them lack a little flexibility. Great explaination. Thank you very much.